About "Wotn #03 in Perfect Time (#03 in Wings Of The Nightingale Series)"
A wartime correspondence between a World War II flight nurse and an army engineer takes an unexpected twist when she arrives to evacuate the wounded in his battalion. Lt. Mellie Blake is a nurse serving in the 802nd Medical Squadron, Air Evacuation, Transport. As part of a morale building program, she reluctantly enters into an anonymous correspondence with Lt. Tom MacGilliver, an officer in the 908th Engineer Aviation Battalion in North Africa. As their letters crisscross the Atlantic, Tom and Mellie develop a unique friendship despite not knowing the other's true identity. When both are transferred to Algeria, the two are poised to meet face to face for the first time. Will they overcome their fears and reveal who they are, or will their future be held hostage to their past? And can they learn to trust God and embrace the gift of love he offers them? 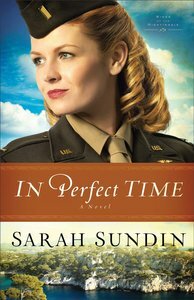 Combining excellent research and attention to detail with a flair for romance, Sarah Sundin brings to life the perilous challenges of WWII aviation, nursing, and true love. They know everything about each other--except their real names. Sarah Sundin is the author of A Distant Melody, A Memory Between Us, and Blue Skies Tomorrow. In 2011, A Memory Between Us was a finalist in the Inspirational Reader's Choice Awards, and Sarah received the Writer of the Year Award at the Mount Hermon Christian Writers Conference. A graduate of UC San Francisco School of Pharmacy, she works on-call as a hospital pharmacist. During WWII, her grandfather served as a pharmacist's mate (medic) in the Navy and her great-uncle flew with the US Eighth Air Force in England. Sarah lives in California with her husband and three children. Sarah Sundin is the author of A Distant Melody, A Memory Between Us, and Blue Skies Tomorrow. In 2011, A Memory Between Us was a finalist in the Inspirational Reader's Choice Awards and Sarah received the Writer of the Year Award at the Mount Hermon Christian Writers Conference. A graduate of UC San Francisco School of Pharmacy, she works on-call as a hospital pharmacist. During WWII, her grandfather served as a pharmacist's mate (medic) in the Navy and her great-uncle flew with the US Eighth Air Force in England. Sarah lives in California with her husband and three children.